There are many different species of Allium, some found in the wild and some cultivated specially for the garden. They vary greatly in their flowers and foliage. 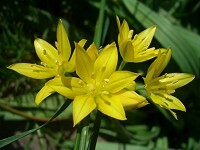 Allium Moly is a native of Southern Europe. The bright yellow flowers appear in groups up to 5 cm across. Each star-shaped flower comprises six pointed petals. The leaves are long, narrow and grey/green.